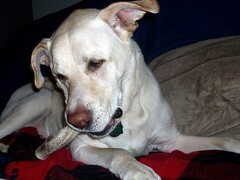 Does your dog jump for joy over bully sticks or antler chews? Check out BullyStickDirect.com and you just might join in the jumping when you see their wholesale pricing available directly to you, the consumer! BullyStickDirect, an online retailer based in New Hampshire, carries a variety of all natural dog treats of the highest quality available. Their products have no additives or preservatives. 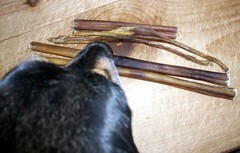 BullyStickDirect offers wholesale pricing and low flat rate shipping on bully sticks, antlers, pig ears and more. 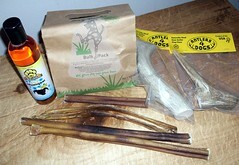 bully sticks, elk antlers, organic shampoo and a bag of Dog Rocks for review. 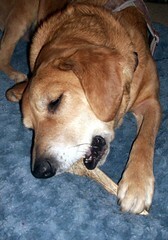 Of course, they were most enthused about the elk antlers and bully sticks... I couldn't get the shots without little noses in the corners! 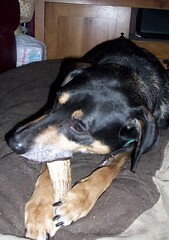 The Lapdogs are huge fans of antler chews, as is the Lapdog Mama. 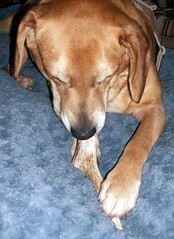 I no longer give them rawhide and these are a wonderful, longer lasting, safer solution. The elk antlers from BullyStickDirect have no odor, leave no residue, will not splinter and are a perfect long lasting all natural chew. 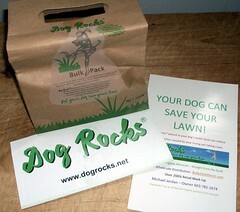 Dog Rocks are a unique product used to help prevent burn patches left on your lawn after your pooch does her business. The natural product from Australia is designed to be placed into your dog's water bowl. You can learn move about Dog Rocks here. 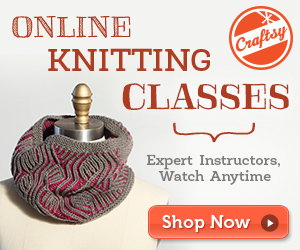 We did not review this product due to the nature of how they work. Instead of emptying your dog's water bowl, you must just continue to add fresh water to it. Due to the pickiness of some of the Lapdogs who prefer not to drink their sibling's drool, this is not possible in our house. If anyone is interested in trying these out, please email me. We'd be more than happy to pass the bag along to you if you'd just cover the shipping. MJ Organic Pet Shampoo is all natural, USDA approved, certified organic and Made in the USA. A pure, gentle castile soap product, MJ Organic Pet Shampoo is made from saponified organic coconut, olive and jojoba oils, natural essential oil blend including tea tree and organic orange oil, organic aloe vera and rosemary extract. This shampoo is specially formulated for your sensitive pet without artificial foaming boosters or synthetic preservatives, dyes and perfumes. 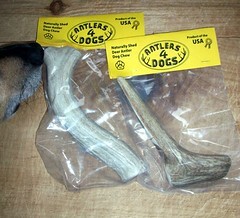 If you're looking for bully sticks, antlers or other unique products, check out BullyStickDirect - we're giving them the Lapdogs official 16 Paws Up Seal of Approval! We used to be big Bully stick fans, but Sis can't have them. And Dadaw cures their own antlers for them... spoiled much!? Thor drools too much for the rocks to work out; in the summer, we have to change his water twice a day. There's the disadvantage to a Mastiff! 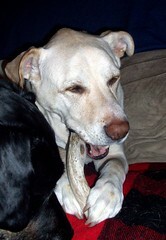 I know lots of dogs are crazy for them, but my dogs have never had bully sticks or antlers and never will. After paying for two root canals, I'm careful of what they can chew. We've found that antlers actually help to keep our dogs' teeth clean and I like that they actually provide some beneficial nutrients.